Road Control is a set of routing and optimizing technologies, tools and services, working with high-quality road and spatial map data. Besides NaviGate platform, Road Control technology is also available in the form of web services and applications. Try 14-day trial on www.roadcontrol.eu website. For whom Road Control is intended? Facility management and other branches. Searching for routes including freight transport and related limitations (vehicle type, load dimensions, weight, legislative restrictions, local limitations etc.). Optimization of distribution / collection. Optimization of business or commercial representatives (salesmen) trips. Optimization of business and service networks. Calculation of arrival times and distances or time availability. Determination of driving time and distance ranges. Determination of optimum distance of depots, client and service centers with regard to client locations. RELIABILITY - well-proven solution and results. ACCURACY - high-quality road and map data of Europe with complete HERE (Navteq) attributes. SPEED - fast and robust calculation algorithms. REAL RESULTS - real arrival times based on standard travel on road and street networks. DEDICATED DATA CENTERS – sufficient calculation power and integration options. WIDE RANGE OF PARAMETERIZATION – customizable application based on client's needs and requirements. INDEPENDENCY - dedicated technology and software solution. Try Road Control for FREE. Demo Version of the product Road Control for Windows, for Europe with truck routing support. Fully functional for 14 days. Limited for max. 5 vehicles and one simultaneously active task running by remote calculation. 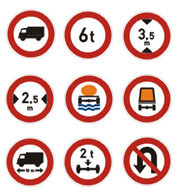 Road Control offer extended 'Searching for a route' function with implementation of specific parameters and restrictions applicable to freight transport with regard to freight specification (hazardous materials, special freights) and physical attributes of vehicle (weight, height, length, number of axles…).